This is one of those movies that I’ve heard about since the start of this site, and not in a good way. 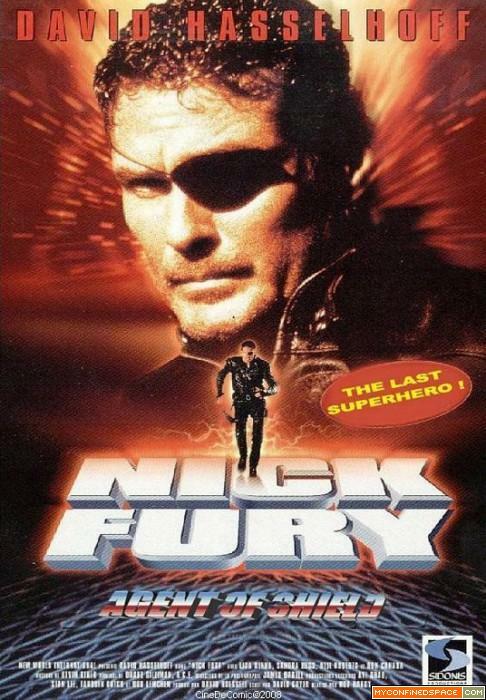 This was a TV movie made for the Fox network starring Baywatch’s David Hasselhoff as Nick Fury and written by prolific superhero screenwriter David Goyer with as many hits to his name as misses. It has a very 90’s generic action feel to it with a ratio of pithy one-liners to actual action scenes at around 20:1. 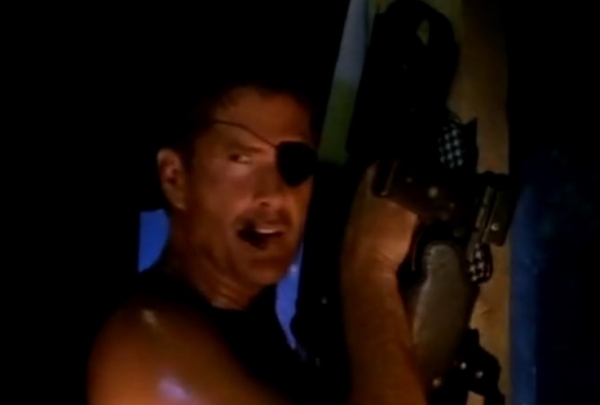 Everyone on screen really hams it up from the Hoff himself pretending to be the hardest hardass that ever lived, his ex-girlfriend Val who’s just as tough as he is, the over-confident fledgling British recruit, to the always-angry executive who thinks Nick Fury is the biggest mistake that S.H.I.E.L.D. Has ever made. And I haven’t even gotten to the villains yet! The special effects look 90’s TV cheap, the fights look like they were done by actors who have never taken a martial arts lesson in their lives, there is more talk about the threats than there is actual action against any threats, but as usual with these kinds of movies, there is plenty of laughable cheesiness to get some enjoyment out of watching this movie. If you’ve seen almost any of the recent Marvel movies you have a good idea who Nick Fury is already, but before the comic book artist for the Marvel’s Ultimates series decided to make him look like Samuel L. Jackson, he was someone who looked more like… well, more like David Hasselhoff. Although I couldn’t tell you if the comic book version was always chewing on a cigar like it was a Slim Jim like the Hoff is during most of this movie, it’s such a small thing to pick on, but I don’t think I’ve ever seen someone smoke a cigar like that in my life. Anyway, aside from that part, he had been kicked out of S.H.I.E.L.D. A few years back and spends his time living in a cave in the middle of nowhere, for some reason. But he’s been called back into duty because someone is after Baron Von Strucker, head of Hydra who’s been dead for a few years now at Fury’s hands, but he also holds the key to the Death’s Head virus which “makes the Ebola virus look like a skin rash”. It’s not long before his body is taken by his daughter, Andrea von Strucker who is also known as Viper. And interestingly enough, she has a vaguely similar look as Viper from The Wolverine and also is immune to a dangerous poison which she gives to Fury through a kiss. The rest of the movie is a combination of the agents trying to track down Andrea and the Death’s Head virus which she intends to release across Manhattan, and Nick Fury powering through a deadly venom with no known antiserum except for the possibility of creating one from Andrea’s blood as she must be immune to it. On top of that, the executive bigwig spends all of his screen time yelling at Fury and blaming everything on his incompetence. In many ways, it felt like a buddy cop movie except Nick Fury was left without any real buddy aside from Val who has barely any personality. Some of the best moments of the movie are when Andrea is absolutely chewing up the scenery with her badly accented megalomaniacal villain, complete with hysterical villainous laughter for no real reason and a creepy looking brother who she is willing to let die to further her own plans. There’s also a handful of weird Hydra lieutenants who are wearing black suits, sunglasses, and are all pale, bald guys that don’t really talk. what a difference a few years and a few million dollars makes. I think one of the worst parts about this movie is that there is no real action anywhere to be found. There are less than a dozen punches thrown, a couple kicks, and maybe a dozen gunshots. The rest of the runtime is filled with exposition and the occasional tension build. Fairly early on, Fury gets hit with the poison and is told that he has 48 hours to live, and that he will be in a weakened state much sooner than that, and he certainly lets everyone know that he doesn’t have much time left and that he’s not at 100%, but he’s still able to out-everything everyone around him. Not only that, but after only a few hours, he’s convinced both the pompous British recruit and the ESP agent with barely any screentime to risk their own careers to follow Fury to Hydra’s base of operations to stop the Death’s Head virus on their end. I could go on about this movie, but there’s just not all that much that really happens. There is an rather pointless subplot involving a life model decoy which has a payoff at the end that makes absolutely no sense at all as to where it came from. It just appears out of nowhere so that Nick Fury can fake his own death to Andrea. And of course it ends in a very 90’s fashion with the villain getting away to come back in a TV spinoff or sequel I’m assuming, and Fury and Val get back together complete with a line from the psychic mention how she didn’t need ESP to see that coming. I think I’m just glad I’ve seen it and now I’m done with it. Until next time, this has been Bubbawheat for Flights, Tights, and Movie Nights. Posted on April 18, 2014, in 90's movies, Marvel and tagged cheesy, film, Marvel, movies, review, SHIELD. Bookmark the permalink. 11 Comments. Why is he the last superhero? That was a bizarre choice for a tagline and never came into play in the movie. All the others stopped caring I guess. Saw a bit of this on Youtube a couple years ago. I was amazed at how bad and over-the-top it actually was. I’m not sure what they were going for there. The sad thing is I don’t think Hasslehoff is all the bad an actor when he isn’t going completely nuts. He’s not an Oscar winner or anything but with a better script and with better direction, he could make an alright, if not good, Nick Fury movie. Oh, and does anyone else find it funny that David Goyer wrote THIS and now he’s considered the go to guy for DC’s movies? When I say that my goal is to watch every superhero and comic book movie, I mean it. And as bad as a movie can be, it’s never hard work watching a movie. A supremely cheesy movie, and one that’s definitely more bad than good. Still, it’s one of those “you have to see this” films for comic book fans, simply because it shows how far the film genre has progressed. Yeah, it’s a pretty big leap from this movie even just to X-Men a couple years later.